Not for more than 150 years has the earth witnessed the amazing event of a blue, red supermoon and total eclipse all rolled into one. Humankind may put on its own dazzling regular fireworks displays, however on the scale of celestial events the upcoming red, blue supermoon eclipse tomorrow night, Wednesday 31st January 2018 is rare and spectacular indeed. A supermoon is a full moon at its closest orbital point to Earth. On average, the moon orbits 382,900 kilometres from earth. Its orbit isn't perfectly circular. 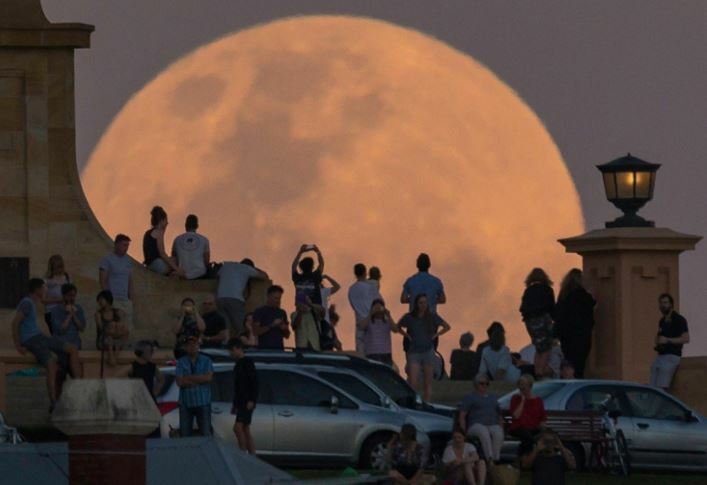 According to astrophysicist Dr Brad Tucker at the world-class Mount Stromlo Observatory in Canberra, the moon can vary in its orbit by 50,000 kilometres. The point where the moon is closest to the earth is called the perigee, whilst the point at which it is the furtherest is called the apogee. Due to a possible perfect combination of atmospheric conditions around the world, astrophysicists are predicting both a blood red moon as well as a blue moon. A common saying for something rare is "once in a blue moon". Well this is much rarer as we're about to witness a blood red moon, a blue moon, a supermoon and also a total eclipse. This rare event will be visible around the world, pending cloud conditions. Be sure to watch it as there is currently no one alive on the planet today who is more than 150 years old who has seen it. You can bear witness to this great historical event and appreciate its grandness, if you step outside and look up! Photo: Jumping for joy during a previous supermoon in Canberra in 2014.